Warmer weather is finally arrived! With spring fially making its enterance, it wont be long before you’ll be out on open waters enjoying sailing and cruising along in your boat. Before you do though, you’ll need to get your boat out of storage and prep it to head back out on the waters. In this post we’ll discuss getting your boat ready for the spring season and out of storage and what to do with your carport. The best word of advice when taking your boat back out after winterizing and storing it, is to consult with the user manual. There will be important and specific information about the manufacturer’s suggestions for seasonal care. Pay attention to mechanics on the boat and be sure to inspect for any cracks and electrical connections and other needed repairs. If there are no fixes needed, you should wash your boat to remove dirt or debris that may have accumulated over the months while it was in storage. This is also a great time to take inventory of safety gear and supplies and ensure the boat’s battery can hold a charge. If your boat was stored under a carport over the winter months, you may be wondering what to do during the warm months when you won’t be using it. The great thing about a carport – especially a metal one – is that they can still provide great protection from the elements, even in the spring and summer months. Rain and strong sunlight are still culprits behind damage to a boat. Don’t leave yours exposed. Perhaps continuing to use the carport when you’re not out on the water makes most sense, if you tow your boat or have a smaller vessel. If your boat will be docked, you can choose to either take the carport down or store it until you’ll need it again in the winter or use it for other storage needs. Carports actually make the perfect place to host a party so weather for outdoor events isn’t an issue. Carport Depot has a selection of galvanized or powder-coated heavy-duty structural steel boat canopies that are designed specifically to shelter your seasonal vehicle all year round. Provide your vehicle with the coverage it needs. Shop today! Depending who you talk to, boating season will soon come to an end. The cold weather makes it less enjoyable for many unless of course, you’re an avid fisherman and must brace the colder water temperatures to get a specific catch. 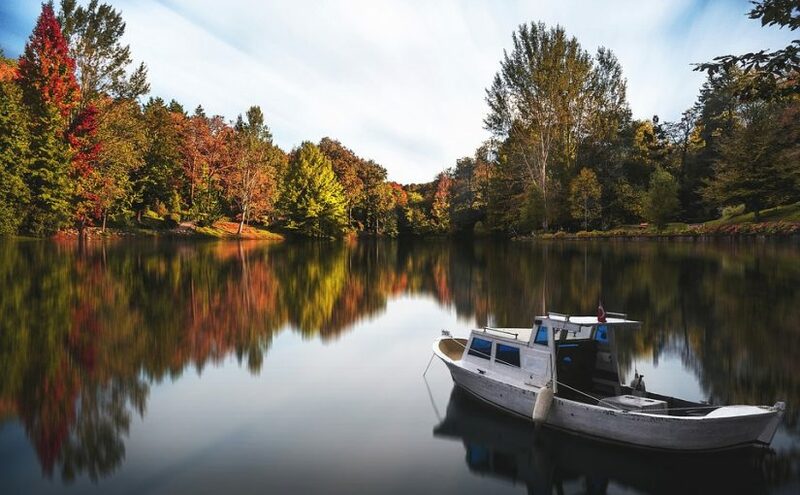 If you’re getting ready to park you boat for the season, consider the benefits of protecting it with a covered shelter versus leaving it out in the open to brace the elements. Here are some of the top benefits of using a boat canopy. A primary reason to invest in a covered shelter for your boat is to keep it clean from debris, rodents and bugs as well as prevent chips in the paint, fading and dents. Winters can be harsh on a boat because of the heavy ice, UV rays and water – all of which gradually damage the surface and interior of a boat. One of the largest costs associated with owning a boat are repairs and equipment replacement fees. Mechanical breakdowns can happen just from bracing the elements and things like water buildup. To slow down the chances you’ll have to make costly repairs before your boat can be used next season, you should store it in a shelter where it’s well protected from the elements. Boats that are left uncovered can easily be stolen from. 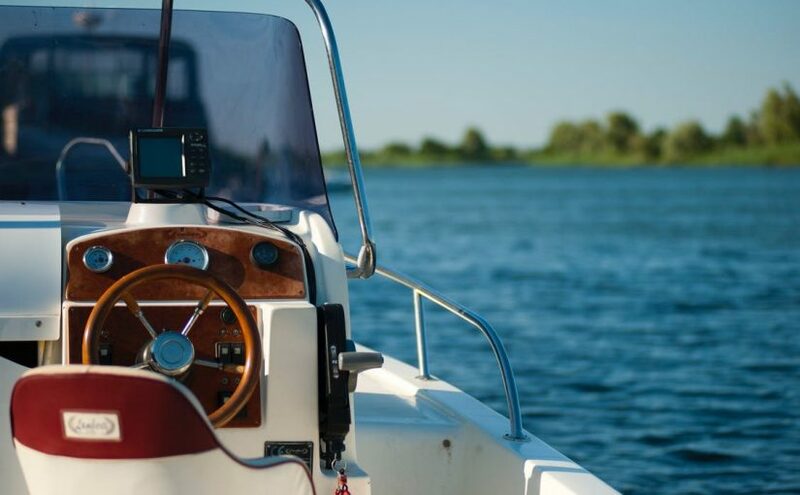 Thieves passing by will have much less trouble getting into the boat to steal electronics or other commonly stolen items like outboards and outdrives when there isn’t a shelter to enter or a cover they must first bypass. As an added benefit, you’ll spend less time trying to clean up the boat and get it back on to the water when the new season comes around so you can spend time doing what you like instead of maintenance work while you watch everyone else enjoying the waves. Boat shelters from Carport Depot are built from galvanized or powder-coated heavy-duty structural steel and are designed to shelter your seasonal vehicle all year round. Check out our selection of round, barn, and house-style shelters available in sizes ranging from 12 to 40 ft. wide to fit your specific needs. Where Will You Store Your New Boat When the Summer Is Over? Memorial Day is right around the corner. The holiday marks the unofficial start of the summer. Many people enjoy spending time out on the water relaxing on a boat, fishing, swimming, and traveling with family and friends. If you recently bought a new boat, you are undoubtedly excited about your purchase and looking forward to trying it out. However, you may not have thought ahead to what you will do with your boat once the summer inevitably comes to an end. A boat needs to be put into storage during the winter to protect it from storms that can cause rough seas. Many people put their boats inside garages for the winter season. If you do not have a garage on your property with room to store a boat in the off-season, there is another simple and affordable solution: You can buy a portable garage. A portable garage can protect your boat from harsh winter weather. It can keep snow and rain off your boat so it does not become damaged. A portable garage can protect your boat from strong winds that can blow branches and other debris and can prevent blowing objects from causing scratches and dents in your brand-new boat. Portable garages come in a variety of sizes and designs to suit virtually any need. Some are made big enough to store even a large boat. You can choose the portable garage that is the right size for your vessel, whether you have a small boat or a yacht. Portable garage designs vary. You can choose a house style portable garage with a peaked roof that will allow snow to roll off easily in the winter, or you can opt for a rounded portable garage to store your boat. Portable Garage Depot offers portable garages in a wide array of designs, sizes, and colors. They can be used to store a variety of vehicles, including a boat, during the winter. A portable garage can protect your valuable new possession from harsh winter weather so you will be able to enjoy it again next summer, and for many years to come. Order a portable garage from Portable Garage Depot today so you will be prepared to shelter your boat when the summer is over. Where Will You Store Your Boat This Winter? Summer is in full swing, and thousands of people all across the United States are enjoying spending time on the water in boats. If you own a boat that you use for fishing, waterskiing, or just relaxing far from shore, it is an expensive and prized possession that you want to protect. Boats need to be covered when they are not being used in the fall and winter to protect them from rain, snow, and the sun’s damaging UV rays. Even though it is July, now is the time to start thinking about where you are going to store your boat this winter. The safest place for a boat in the winter is on dry land where it will be safe from wind, waves, and debris that could be blown in storms. A boat is too large to fit in many traditional house garages, especially if they are already being used to store vehicles. If you need a place to shelter your boat during the winter but you do not have space in your garage, a good alternative is a portable garage. Portable shelters are available in a wide array of sizes to protect one or two boats from harsh winter weather. Carport Depot offers boat shelters in sizes that range from 12 to 40 feet wide. If you need to protect two boats, you can store them in one shelter rather than having to buy two. You can find the shelter that is the perfect size for your needs at Carport Depot. We offer boat storage shelters in a variety of styles, including barn, house, and round designs. You may prefer one design over the others based on the height of your boat. No matter the size of your vessel, you can find the right size shelter here. 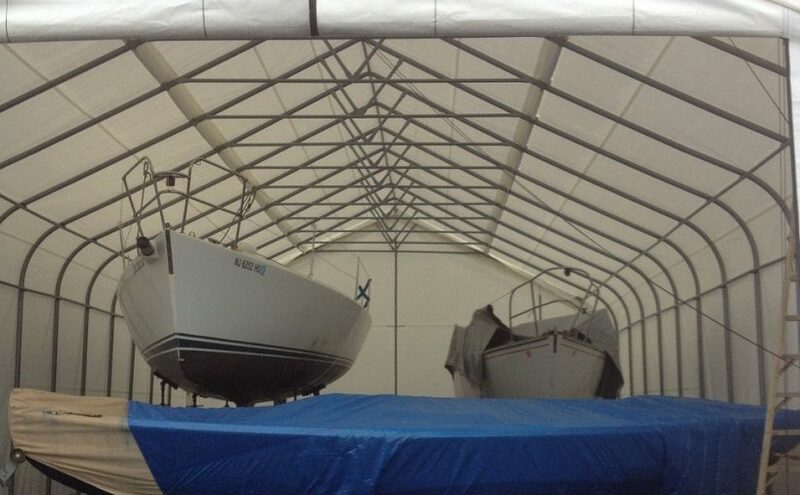 Our portable boat shelters are made to last and can stand up to all kinds of winter weather. They are constructed with galvanized steel frames and have durable polyethylene covers to protect boats from water and the sun’s UV rays that could cause paint to fade and peel. Your boat is an expensive investment that you want to be able to enjoy every summer for as many years as you can. You will need to protect it from winter weather to keep it in top condition. A boat shelter from Carport Depot can provide you with the all-weather protection you need. Look through our selection of boat shelters and place your order today. Summer will be over before you know it. If you enjoyed taking a boat out on the water, you will unfortunately have to store it for the winter. Now is the time to start to think about winter storage. Time off in the winter can be hard on a boat, even though it isn’t being used. Long periods of inactivity can lead to increased wear and tear and cause your boat to break down next summer. Rust can spread if it is not treated, moisture can freeze, and lubrication can congeal. In order to avoid these issues and expensive repair bills next summer, you need to protect your boat in the off-season. The best solution is to store it in a garage. If you don’t have enough space, you can wrap it and store it in your yard. Another solution is to store your boat in a portable garage. A portable storage building will shelter your boat from winter snow that could allow moisture to seep into it. It can completely surround your boat to keep it dry all season. This can prevent water from damaging electrical systems and causing rust that could be costly to fix. It can also shield your boat from the sun’s UV rays that can cause damage to the paint, even on winter days. Our boat storage buildings are sturdy and affordable. They are crafted with heavy-duty powder-coated steel frames and polyethylene covers and are anchored to the ground so they can stand up to harsh winter winds. A portable garage is the best place to store your boat for the winter if you do not have space in a traditional garage. With the lazy days of summer long gone and winter fast approaching, it’s time to make sure that your boat is protected from the elements during the cold winter months. A portable shelter is your safest and most economical option for keeping your prized possession in top shape so it will be ready for more fun on the water next year. Whether you have a fishing boat, pontoon, yacht, rowboat, dinghy, trailer, sail, or other equipment, a portable shelter is your best storage option. Dry docking fees are expensive, and other winter storage methods, such as shrink-wrapping, are less effective at protecting against the extreme elements. A portable, weather-resistant boat shelter provides protection from low temperatures, snow, sleet, ice, and the sun’s UV rays. Exposure to the elements can cause a myriad of problems in boats, such as cracks, mildew, dry rot, fading, corrosion, ice formation, and other damage that can result in costly maintenance or cause the boat to break down. Portable Garage Depot has shelters that are easy to assemble and come in a wide assortment of lengths and heights to suit your individual needs. Our shelters are built with sturdy frames, made of powder-coated or galvanized steel, and polyethylene covers that provide the best protection from Mother Nature this winter. With shelters in both house and barn styles, we can help you protect your boat, trailer, and any other related equipment. 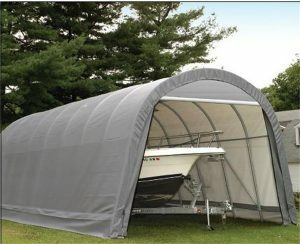 Our shelters can increase in size in two-foot increments to give you the perfect amount of space to store your vessel. Choose a shelter that allows a few extra feet of interior space so you can check on the boat throughout the winter. With four walls of protection and double zipper doors, your boat will be protected from the damaging elements all winter long. With top-notch construction, our shelters will keep your boat safe so it will be ready for months of fun on the water again next summer. Call today for more information.